Product information- Forbis Classic 2 in 1 Shampoo & conditioners Our 2 in 1 Shampoo & Conditioner is a gentle. It removes dirt, grime, and odor without being harsh on the skin or coat of your dog. It rinses out quickly making bath time a fun activity. Directions : Shake well before using. Wet pet's coat completely with warm water. 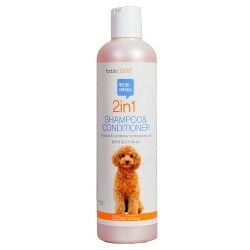 Dispense a generous amount of shampoo into palm of hand and thoroughly massage into pet's coat beginning at head and working back towards the tail. Avoid getting into eyes. Rinse completely. Repeat as necessary.